Du30’s detractors are on full alert now that their drug war media propaganda is disregarded by international bodies. Now, they turn to the country’s friend since Marcos’ time, China. Liberal Party supporters now pay attention with the mortgage to China after the latter bestowed infrastructure loans to the administration without internal interference. A pro-LP media recently claimed that in the recent UNHRC universal periodic review for the Philippines, only China out of 47 countries believed Senator Allan Peter Cayetano’s defense on the alleged drug war human rights record. If the rest of the 46 countries did not buy Cayetano’s explanation just because they still urge the government to stop extra-judicial killings, why is EU now in support with the anti-illegal drugs campaign? 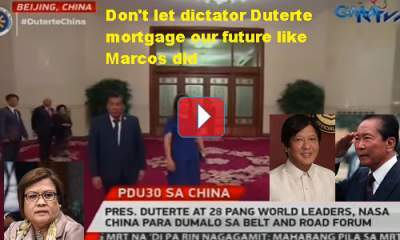 The president’s economic relation with China is criticized by the anti-Marcos people. They claimed that the friendship is no longer between the president and China. Those who oppose Bongbong Marcos’ return to power are scared that the Philippines now enters a new chapter in foreign relations as it fosters the relationship with its rival over its claims in the West Philippine Sea or the South China Sea. They consider this as mortgaging the country’s future for the second time after the Marcos regime to an economic giant. How can they be worried that China can expand communist imperialism this way when it was the late Noynoy Aquino who tolerated community rebels in the country to help destroy the golden age? They criticize the agreements on Chinese infrastructure loans called the “Build, Build, Build.” This is no doubt the driver of the success of the Marcos governance. In fact, the late president highlighted in his. Gold reserves at the world bank can only be used to enhance public service for the welfare of the people. Projects such as infrastructure, education, and health care must be prioritized. Why do the anti-Marcos politicians try to block the progress of the people? It is clear by now what former president Ferdinand Marcos said that pro-communist people are the once who deprive its citizens of the right to vote and social benefits. Therefore, it is clear that these Liberal Party players are the real communists hiding behind their improvised democracy.